The commissioner, in a statement, gave their names as Bamidele Ayodele Samson, Bamidele Philip, Tunji Oladapo Sowale, Bololaji Olalekan, Abdulrauf Abiodun, Olaleye Pelumi, Anuokuwapo Olanrewaju, Paul Damilola, Olateye David Tobi, Arewa Adekunle Ibrahim, Oyesanmi Ayomikun Oluwaseun, Olaleye Israel, Adediran Kemisola, Omobolade Alarape, and Olowolusi Oluwatomisin. 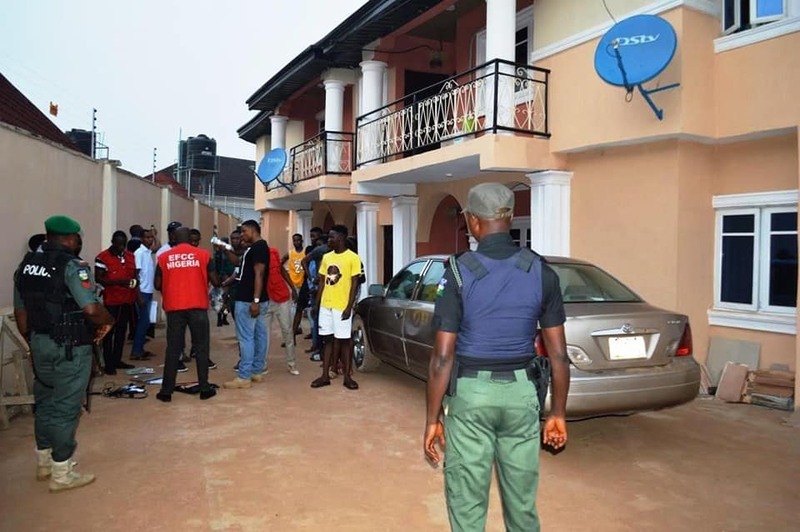 In a sting operation led by the zonal head, Friday Ebelo, the suspects who are between the ages of 21 and 35 were taken aback when operatives swept on them at one of their notorious havens in the city. Five of them allegedly claimed to be undergraduates while the other 10 claimed to be self-employed in varied vocations. Their arrest followed series of intelligence revealed that the suspected fraudsters engaged in fraudulent activities of obtaining money by false pretences from unsuspecting victims. At the point of their arrest, EFCC operatives recovered SIM cards, one car, laptops, telephones, female underwear and four bags of fetish objects (juju) from them. Several documents containing false pretences were also recovered from the suspects. The EFCC says they’ll be charged to court soon.